Italian Beef Roast Sandwiches are my new favorite way to do an Italian roast beef. The beef is slow cooked in savory juices with a little kick of spice. So this is now officially my new favorite way to do a roast. 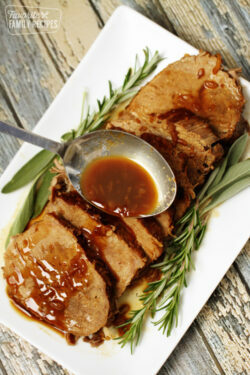 Next time I am going to make this like a regular roast and use the dripping to make a gravy. It is so incredibly flavorful and has a little bit of a kick to it. 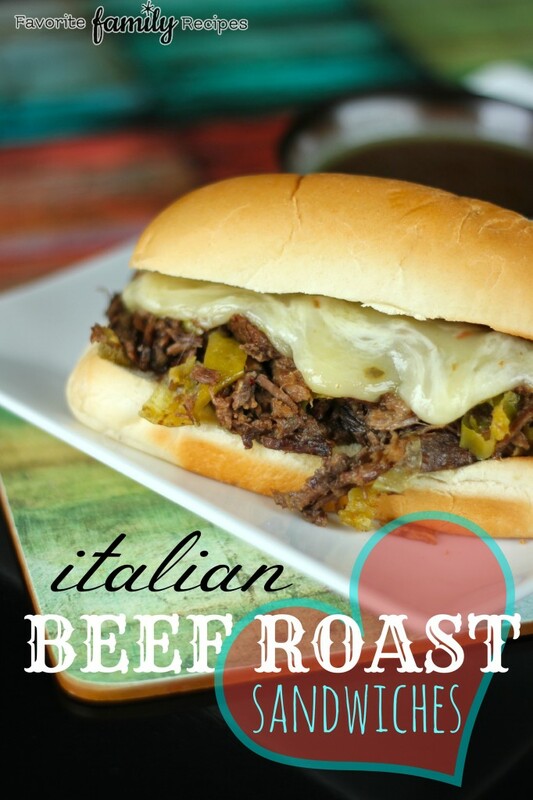 Trust me, this Italian Beef Roast sandwich is a real husband pleaser! Preheat oven to 275. 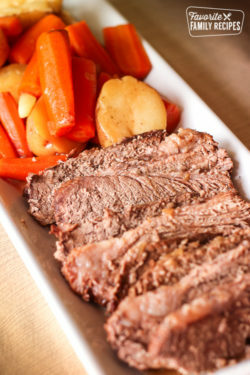 Place your beef roast in a large roasting pan, then pour the 2 cans beef consomme over the top. Pour 1/2 the jar of pepperoncini peppers, including juice, over the top. Then sprinkle the dry italian dressing mix, minced garlic, and kosher salt over that. Cook for about 6 hours, roast should easily shred, if not cook a little longer. When the roast is done, shred the beef into the juice and pepperoncinis. Open the french rolls and place open face up on a cookie sheet. Layer one side of each roll with sliced pepper jack cheese. Place pan under the broiler on high until cheese starts to melt. Remove pan from oven and line each sandwich with shredded beef, using a large fork or slotted spoon. Ladel out some beef juice into a small cup to use as ajus for dipping. What type of beef roast did you use for this? Do you think this would work in the crockpot? We used a chuck roast, but feel free to use whatever kind you like best. And yes! 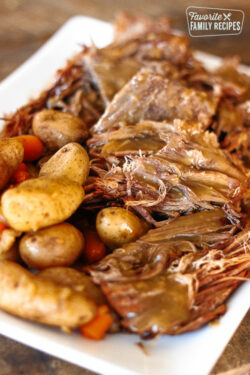 You can do it in the crockpot on high for about the same amount of time (check it at 6 hours). I have made this same recipe for several years in the crock pot. It is a family favorite. I always brown my meat coating it in flour, salt and pepper in a little oil on the stove before putting it in the crock pot. 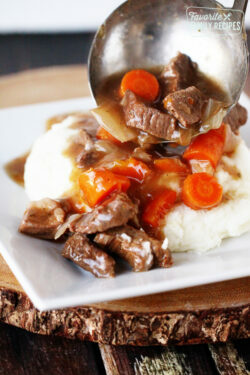 You will want to make plenty for left overs! I’m guessing 8 to 10. Do you cover the roast during cooking time? I am about to put it in the oven and am unsure. Yes, I covered mine, I will fix that on the recipe! Thanks! How much is 2 cans consommé? What is the difference between consommé and broth?